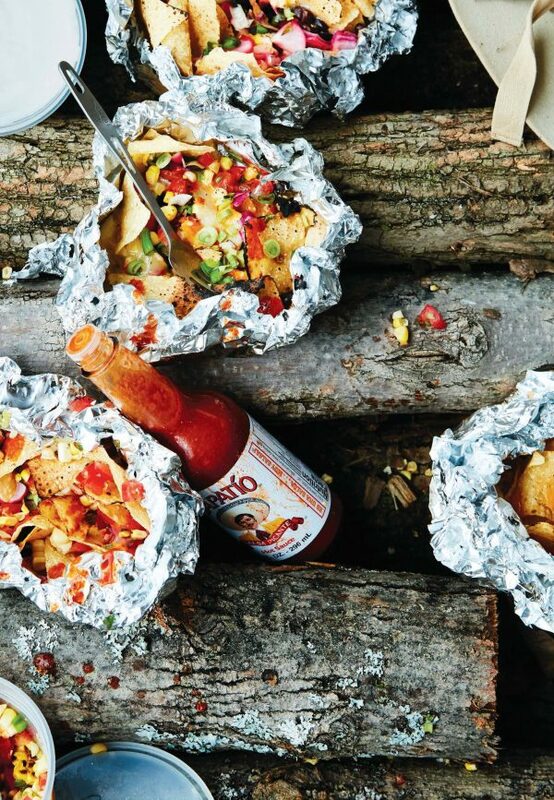 Tucked into the woods, around a crackling campfire, Emma Frisch lays out a luxurious spread. There are cheeses and olives and crackers, next to homemade hummus and bread charred over the fire. Grilled sausages are topped with sauerkraut and honey mustard, alongside grilled asparagus and kale raab and a rainbow of peppers tossed in za’atar seasoning. Lentil salad rounds out the meal, while bottles of beer and wine chill in the cooler. She and her fellow campers feast, under the open sky. “I want people to know that when they’re outside, they don’t have to eat a can of beans thrown over Fritos with ground beef,” Frisch said. In her new cookbook, “Feast by Firelight,” she returns to what she calls “the roots of camp cooking”: simple recipes made from fresh ingredients, enjoyed in the open air like our ancestors did. Instead of those canned beans, how about steak with salsa verde, or salmon roasted in a foil packet? And for breakfast, how about tiramisu French toast, griddled in a cast iron and dolloped with melty mascarpone? 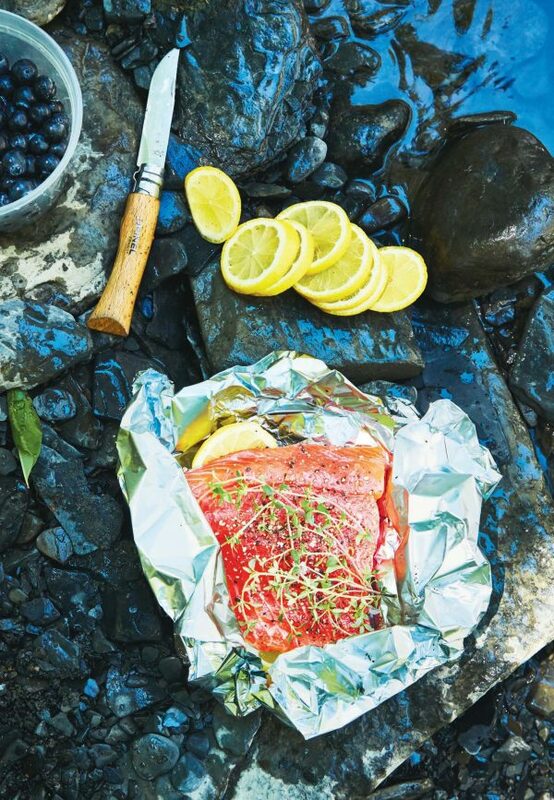 Her recipes are designed for car camping, with a cooler and pans in tow, but are easily adapted to backyard adventures or even the kitchen at home. Crucially, they’re made easy and accessible. 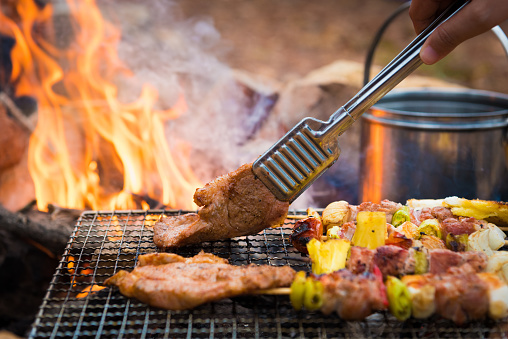 Accustomed to modern comforts, many people are intimidated by outdoor cooking—not knowing how to pack, wrangling an open fire, and forgoing the luxury of running to the kitchen to grab a missing tool or ingredient. To dispel those fears, Frisch opens the book with a comprehensive guide to outdoor cooking. “It can be extremely simple,” she said. She provides everything from recommended packing lists (customize one to your planned menu, to minimize bulk), to how to gauge the temperature of a campfire (hold your hand four to five inches above the coals and see how long you can keep it there—two to three seconds signals high heat), to tips for at-home prep (the key to cooking good food outside, according to Frisch). Preparation is the biggest hurdle. But if you pack the right equipment and prep key recipe components beforehand, “when you get there, everything’s just ready to assemble,” she said. The book draws upon a childhood of eating out of a backyard garden, college years working as a backcountry guide, and a lifelong love affair with the great outdoors—experience reaped from countless adventures. Frisch’s reverence for nature infuses every page. “My mother believed fresh food and fresh air were key to raising healthy children,” she writes. And so her childhood was one of hikes and impromptu picnics set up by her mother, an alfresco meal magician; afternoons spent building a kingdom—kitchen included—with her twin sister in the woods around their house in Wilton, Connecticut; and holidays spent visiting family in Italy, wandering the Italian Dolomites. “We would pack a lot of picnics and set off on the trail and be gone for hours, lost in the mountains, eating panini,” she said. Some of her recipes document those picnic staples growing up. 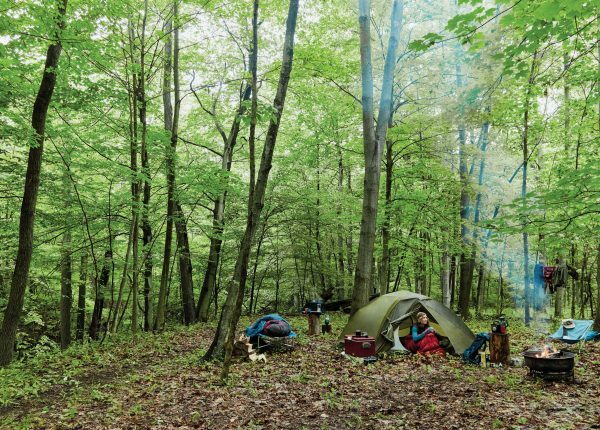 In adulthood, Frisch’s combined love for food and the outdoors has taken her across the world, from researching sustainable food systems with farmers in Ecuador and Kenya; to opening a makeshift hotel and restaurant with her husband in Matagalpa, in Nicaragua’s coffee country; to running a “glamping” site, Firelight Camps, in Ithaca, New York. Once, it took her to the sweeping deserts of Rajasthan, in northern India, where she slept under the stars and feasted on decadent Indian spreads—fresh naan, daal, goat curry—conjured up by a local guide over a fire started in the middle of the sand dunes. Each meal concluded with a jam session: drumming on the cleaned pots and pans. Frisch takes inspiration from her travels—there’s a recipe for cardamom-mint Turkish coffee discovered in Istanbul and campfire-friendly salami and snap pea paella inspired by a Spanish roommate in Ecuador. There’s much to be learned from how people cook around the world, she said. There’s a certain sense of magic that accompanies the campfire. Immersed in nature and free of modern distractions, it’s a space that nurtures organic connections—with yourself, the people around you, and nature. It’s cooking in its most natural, ancient form. And when you’re outside, your senses are heightened, unclouded by distractions, and you’re suddenly aware of the sounds of nature. “You’re listening to the birds and feeling the wind, and I think it really does kind of charge our senses, spark them up,” she said. For Frisch, the experience is as perfect as it gets. It’s one she wants to share with more people. “You’re outside, you’re with the people that you’ve chosen to be with, you’re sharing food together,” she said. 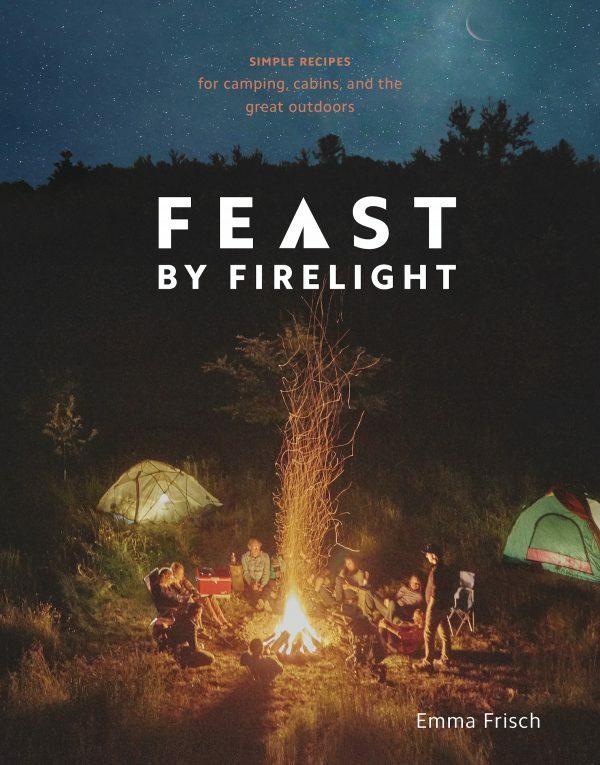 “Feast by Firelight: Simple Recipes for Camping, Cabins, and the Great Outdoors” by Emma Frisch ($22).